When it comes to cheap thrills, no one does it better than the king. I really enjoyed the first book in this series last year, Mr. Mercedes, and this second installment is also very good. 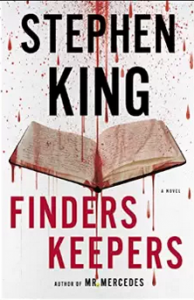 Finders Keepers begins with the murder of a famously reclusive author and the theft of his precious notebooks containing the unpublished contents of two highly anticipated novels. After burying the notebooks in a trunk for safe keeping, our villain gets put in the slammer for a few decades, and a teenage boy finds the trunk and its valuable stash. This sets up a showdown with bad guy after his release from prison. King flips the bird at normal literary conventions, waiting to bring Bill Hodges into the story after 200 pages of rising action. We also get Jerome and Holly back as Hodges' trusty accomplices. He delivers a thrilling finale and sets us up for book 3 in the last chapter. I gave Mr. Mercedes a well-deserved perfect score, having found it deliriously entertaining. Finders Keepers was very good, but not quite at that level. One issue is that the villain here is less compelling than Mercedes' Brady Hartsfield. Apparently King realizes this as well, as he indicates plans for a horrifying resurrection of Hartsfield in his final volume. I can't wait!